I also have a bad habit of riding high on the race adrenaline and coming out strong in the first mile-ish then burning out by the end of the race. So, yesterday, I took the first mile pretty slow and gradually (then not so gradually!) 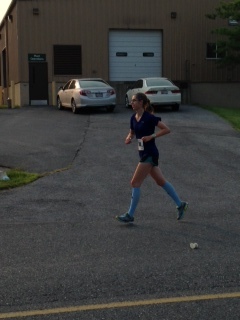 picked up the pace throughout the race, leaving enough energy to really kick the last ~0.3 at the end. Unfortunately, the race was not chip timed, so I got a little frazzled in finish-chute confusion and pulling the tab off of my bib, so I ended up stopping my Garmin a little late (it read 3.18 miles, 26:55). I figured that my time was around 26:45ish. After checking my official time, I found out that I ran a 26:42!! It was a double-loop course (with a slight variation in the second loop), and (I think) this was around the beginning of lap 2. It looks like I’m walking (I’m not). 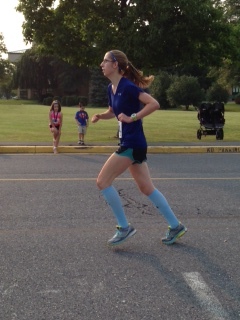 Long legs + trying not to push my pace too hard = short stride and awkward photo. I think I was trying to fly, because those are some serious chicken wings! 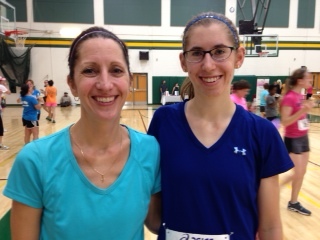 My mom has been running with me (well, we split up and run different routes in the same park) in the mornings and she also ran yesterday’s 5K! 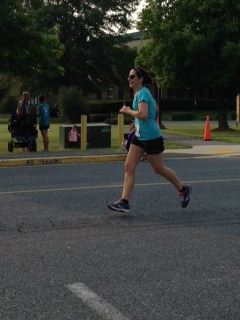 …And my powerhouse momma finished in 34:48! After I finished, I had just enough time to grab a water, a chocolate milk, and half a banana before I headed back out to the finish line to cheer her on as she came down the last stretch. And thanks to allergies, I arrived at that race with a voice…then I ran, screamed for my mom at the finish, and talked a LOT after the race…and I left without a voice. 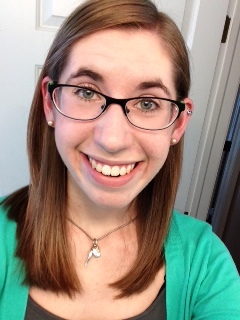 Now I sound like a sixty-year-old man…NOT cute (but so worth it!). 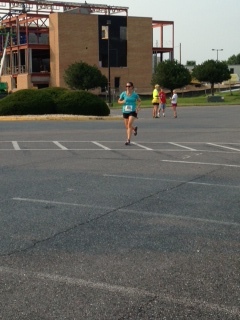 Overall, I would say the race was very well organized and lots of fun! The course marshals were very encouraging and helpful, the water stations seemed to be running smoothly (I didn’t stop for water), and the volunteers were friendly (and there were a lot of them!). Being a two-loop course with a slight variation in the second loop, the course had the potential to be confusing but was actually very well marked and staffed to prevent any mishaps. 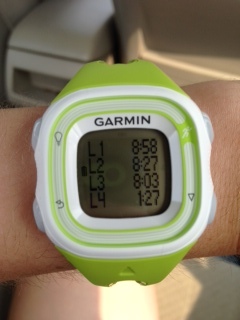 However, as I mentioned briefly above, I wish that the race had used chip timers. The finishing-chute situation was a little funky and overwhelming, but luckily did not seem to affect the accuracy of finishers’ times. Additionally, the double-loop course caused a little bit of congestion when the faster runners started to lap the slower runners/walkers. Out of all of the runners, I placed 43/329, which I would call a win since I am definitely not 100% yet! I finished the race not feeling very tired or out of breath at all, which was both frustrating and encouraging: I know I could have run faster, but I know it was a good thing that I didn’t, since I am still recovering; however, it did make me happy because I know that as my ankle continues to get stronger, I can push my pace more and hopefully bring my time down considerably! 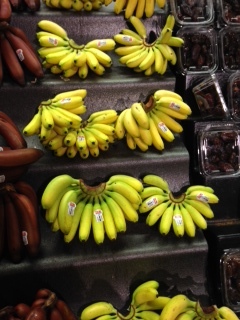 In other news – because this just NEEDS to be talked about – how did I NOT KNOW that mini-bananas are a thing??!! I saw them at Wegman’s the other day and it kind of blew my mind. What a genius idea! Bananas, snack-size-ified. Except…who would want to eat a little teeny banana when you could eat a banana the size of yo face? 😀 But I did want to buy them just because they were so adorable! 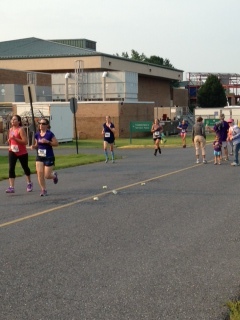 Did anyone else run a race this weekend? How did it go?